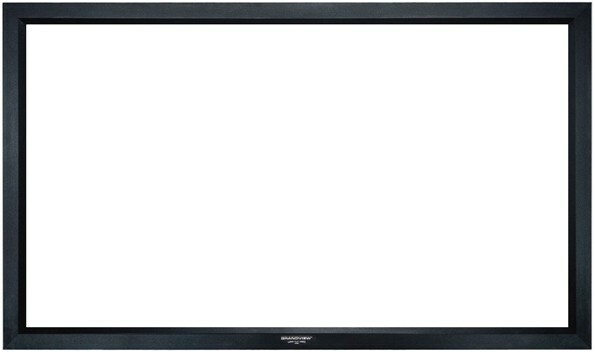 The Grandview Cyber Fixed Frame 16:9 screen is ideal for a home cinema set-up where the screen can be fixed to a dedicated position on the wall, we also sell retractable Grandview screens. The GrandView Cyber Fixed Frame 16:9 series of Projection screens offer the ultimate in uniformally flat projection surface. 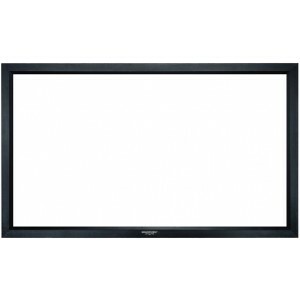 Ideal for permanent more dedicated cinema rooms, the fixed frame screen gives a true cinematic experience. The multi ply vinyl projection screen material is kept under high tension by a unique means found only in Grandview products. Steel bars are inserted into a looped seem that runs round the edge of the material. The bars are then fixed into the aluminium frame, causing the material to be pulled evenly from all four sides. The aluminium frame features a black velvet finish and seamed material with steel tensioning bars for ultra flat projection surface. The screen is measured by the width of the material from left to right. The standard sizes are 6ft, 7ft, 8ft 9ft and 10ft. The viewable area is the white part of the screen which is slightly smaller due to the surrounding black borders.